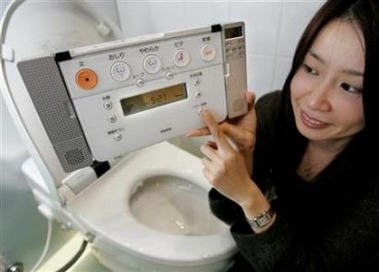 The blazing-bidet scandal continues to grow in Japan, with the country’s second-largest toilet maker now joining the market leader, Toto Ltd., in admitting that it has been aware for years of defects in its "washlet" products. INAX Corp. said today that it knew of at least seven cases of its washlets overheating, emitting smoke or catching on fire between 1991 and 2005, but did not make the incidents public. It had recalled 30,000 washlets in 1985 for similar problems, but the seven cases obviously post-dated the recall. INAX said that none of the seven incidents involved personal injury and that it had reported them to the appropriate government ministry. The article did not say which government ministry would be the appropriate one to receive such a report. Coincidentally, INAX made the incidents public only after its competitor had already publicly apologized to consumers for its own washlet problem. Toto apologized earlier this week and said it would check and repair about 180,000 washlets to correct a defect that might potentially result in a very inconveniently timed fire. she said the company would be phasing out. Washing One’s Backside Since 1980! but I would strongly encourage it to do so. Does your company’s mission statement promote a culture of washing one’s backside? If not, please amend it without delay.